The University of Rhode Island’s Multi-Cultural Student Involvement Council (MUSIC) will host their annual conference to help minority students achieve academic success. The Diversifying Individuals Via Education (DIVE) RI Conference will be a two-day held on the Kingston campus, from March 4-5. These conferences began almost three years ago when Zulmy Cortez, the current president of MUSIC, Dayo Akinjisola, the finance chairman, and a few other members attended the National Conference for Race and Ethnicity in American Higher Education (NCORE). NCORE provides a national forum for discussion about ways to strategize the enhancement of education and positive communication in culturally diverse settings. While attending NCORE, the future founders of MUSIC’s DIVE conferences realized the significance of engaging in meaningful dialogue for the purpose of planning ways to improve relations on campus and increase opportunities for academic success in traditionally underrepresented populations. 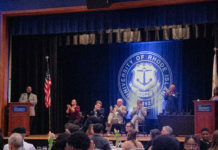 They also learned about other schools creating similar meetings, and decided then to form a student-led and student-run conference of their own at URI. Luckson Omoarogba, the speaker’s and presenter’s chairman, furthers this idea by stressing the importance of making these conferences student-orientated. He said that the goal is to “create a space where college students of any identity can come and feel empowered and filled with the knowledge and skills they need to be positive, social change agents.” In addition, this conference also serves as an outreach to neighboring colleges, such as Providence College, Rhode Island College, Roger Williams University, Bridgewater State University, Boston University and more. As URI begins to lead by example, it will also attract students from more diverse populations to the university. Guest speakers for the conference include opening keynote speaker Dr. Tricia Woods, a professor of Africana Studies and the Director of the Center for the Study of Race and Ethnicity in America at Brown University, and rapper Common for the closing keynote speaker. The guest speaker on Saturday, March 5, will be Rhode Island Secretary of State Nellie Gorbea, the first Latina to be appointed office in the state of Rhode Island.